This is a slightly used complete outfit. 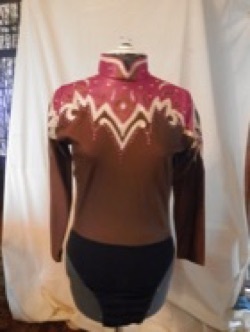 The top has fusha pink lambskin trimed with copper and cream leather and tons of crystals. It zips up the back and has a snap bottom to keep it firmly tucked in. 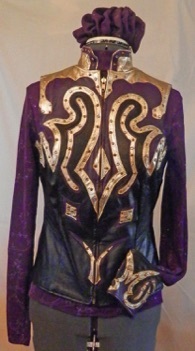 It comes with matching pants, belt, and pig suede chaps. The top has a 34" bust x 32" waist with a 21 1/2 sleeve length. The pants have a 27" waist and 31" inseam. The belt is 35" end to end. The chaps have a 27" - 30 1/2" waist, 23" thigh, and 31" inseam. Pull over peach spandex shirt with light blue lamb skin collar and cuffs. 31" bust. Tan and navy ultrasuede vest. 31" bust. 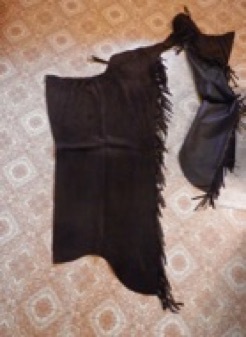 "Black & Purple Leather Vest"